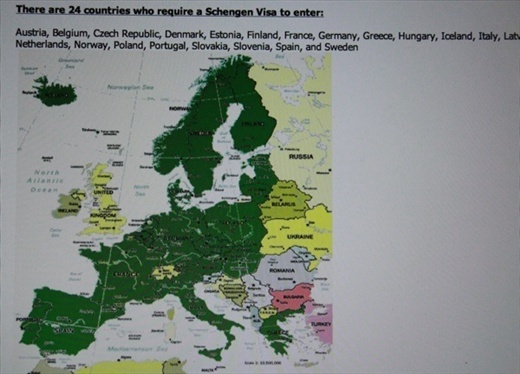 The Schengen Accords are great if you live in the European Union. Now you can travel freely - even move from one country to another - without hassle. If you live in Estonia, for example, now you can move to France and get a job. But it's different story if you are an American vagabond! We first heard about Schengen from Allan and Wendy on the ship to Barcelona. They did their research. We didn't. Oops! According to the rules we can remain in the EU countries for only 90 days in a 180 day period. The United Kingdom, Ireland, and the Balkan states (Bosnia, Croatia, Montenegro, etc.) are not signatories, nor is Switzerland which, nonetheless, abides by the rules. We spent two months in England, to save some of our 90 Schengen days. But now our time is about up! On one hand it's a bit inconvenient for us. We originally hoped to settle down in one country for a while, then move on. But on the bright side, the rule forces us to keep moving - not such a bad thing. We plan on spending the winter in the Balkans, which made coming to Greece not quite as illogical as it first seemed. Now when our time here is up, we can fly to Bulgaria, then work our way into Croatia and the rest until we get a new 90 days. So you can look for us in Italy sometime after the first of the year. Caio!